Our best selling Razor Bump Treatment Kit contains products that have been formulated to help treat and prevent razor bumps & ingrown hair. 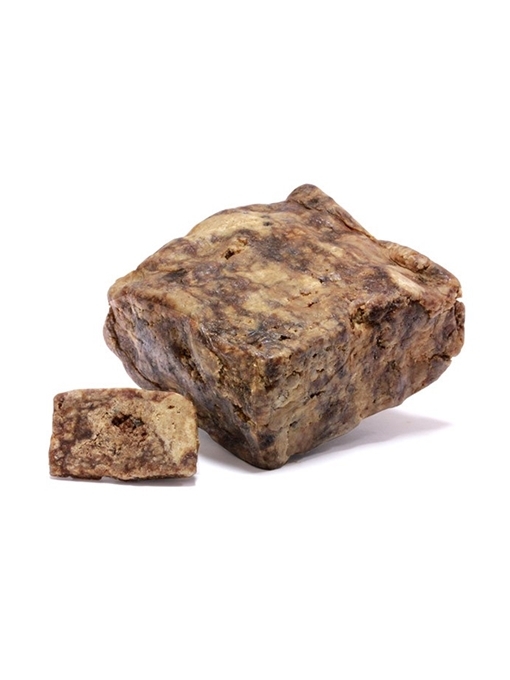 The products in the kit are suitable for all skin types & can safely be used by men & women. Expect to see positive results within a week. Follow our razor bump treatment regimen to treat razor bumps & ingrown hair. Bought this specifically for razor bumps. Does an OK job with that. On the other hand, the facial cleanser is good and leaves my skin feeling clean, however, the acne cream leaves my skin feeling oily/greasy. The item shipped on time. This was a gift for my brother-in-law. His razor bumps and ingrown hair was cleared within a week. I used the razor bump kit religiously to treat my razor bumps. And followed the regimen provided. I must say this stuff is the truth. It cleared all my bumps. 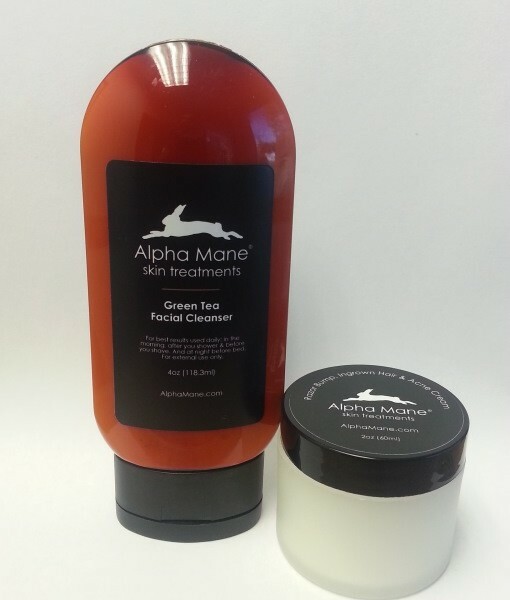 Thanks Alpha Mane, your products are awesome. Your products are simply great. I just ordered a couple of the razor bump kits for my 2 brothers. The first step is probably the most important and overlooked step. Opening your pores, enables the special ingredients contained in our cleanser and razor bump cream do their jobs effectively. So how do you open up the pores? Apply a warm face cloth to the affected area. Let sit for about 3-4 minutes or when the cloth becomes cool. Repeat the process, but this time, let sit for about a minute. With your pores now open, gently apply our Green Tea Facial Cleanser in circular motions in an upward direction. Massage into the skin for approximately one to two minutes. Let sit on skin for about a minute. Rinse the Green Tea Facial Cleanser completely off your skin with warm water. Using a soft cloth, gently pat down on the wet area until dry. In a circular motion, gently apply our Razor Bump Cream to the affected area on your skin. Please ensure the cream is completely rubbed into the skin. And voila, you are done. Treat your affected skin in the morning (after you shower) & at night, before bed. Follow this 3 step skin treatment regimen, and you will start seeing results within days. Purchase our Razor Bump Treatment kit today and begin your journey to having a smoother, healthier skin. 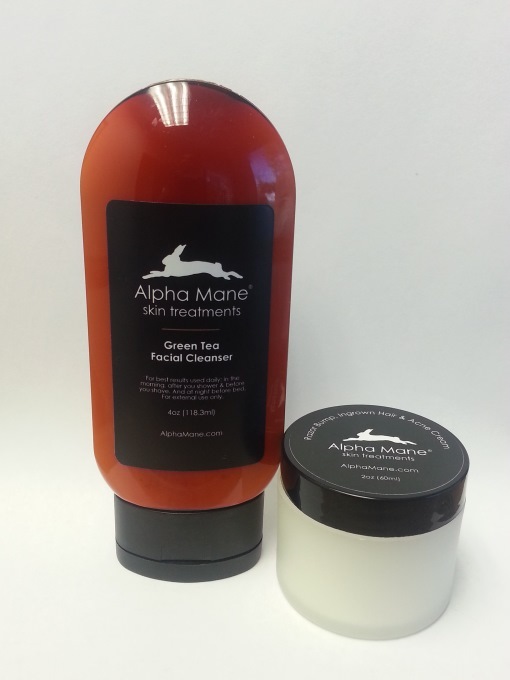 The treatment kit includes the Alpha Mane Razor Bump Cream and our Green Tea Facial Cleanser.